One Sunday morning a few years ago, I sat in the church nursery and talked to a beautiful young woman in her twenties. While I watched some of the toddlers of people who were attending the service, Christina sat in the other rocking chair and cuddled her baby boy. The worship music and then the preaching began to fade to silence in the background as I listened in shock to the story of Christina's family. She told me how she, her parents and sister escaped from the harsh regime of a dictator when she was a child. Sitting in the safety of my church nursery with the smell of baby lotion and arrowroot cookies scenting the air, there was no fear for us, that someone would come pounding on our doors. No soldiers would appear at any minute to stop us from worshipping God. But I was awakened to the fact that persecution is a terrible reality for so many Christians around the world. In Christina's young life she had seen it first hand. The following is her family's story written by her mother, Cornelia. I hope and pray it gives you courage for whatever your situation is. My name is Cornelia Schellenberg. I was born in Romania and grew up in a Christian family, born again since the age of 19. I came to Canada 19 years ago with my ex-husband and our two daughters. Personally, I never wanted to leave my country. I was happy there, even though it was under a communist regime, with a lifestyle of oppression. As Christians, we weren’t allowed to talk about God. Romania has always been a country blessed with beautiful mountains and hot springs, mineral water, gas, petroleum, and mines. It’s also a tourist country. But due to many years of communism and dictatorship, Romania started to suffer economically in a big way. Also, human rights were affected and hope for many was destroyed. That’s the reason many Romanians, along with my husband, decided to leave. So you could only imagine the tremendous decision I needed to support, while risking my life and my daughters’, as well as leaving my home church, family, and friends behind. 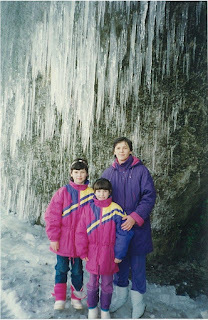 Therefore, against my will, in September 1989, my family and I tried to flee Romania. Our daughters were 4 and 7. In order to have our escape as discreet as possible, we needed to leave in the night and wear dark clothing. We had to instruct our girls to not speak nor ask questions for us to be very quiet because we were on foot the entire night. Due to a long and difficult journey, we only took the necessities, such as some food and change of clothing. As the night progressed, our bodies became very exhausted, taking a few stops along the way, looking each and every direction, observing anyone watching us. As soon as we set foot again, we noticed a herd of cattle chasing us. We all became very frightened and fearful of our lives. I remember crying out to God to drive the cattle away and soon after my cry was heard. Prior to arriving at the Yugoslavian border, we had to cross a very cold and deep river. My husband and oldest daughter went first and before it was my turn to go, I heard a loud warning voice that said, “Stop, or I will shoot you” as the two soldiers pointed their guns at us. My husband on the other side told me to continue crossing, but I froze at the soldier’s threat. This was the first time in my life that I faced death head on. My daughters cried with fear. I prayed like never before that our lives would be spared. My husband on the other hand tried to bargain with them, offering some money and gold, in order to let us go, but his attempt failed. We needed to go to several police stations as we were interrogated for two days. They locked us in a very small and dark cell for several hours. In the meantime, we ran out of food and the girls became hungry and tired. Thankfully, they allowed my daughters and I to go home but kept my husband for 4 more days. During this time, I began to physically suffer the consequences from our journey, through sickness and temporary paralysis. But I can still recall through all my prayers that God was with me in the painful trials, thereby healing me. In the meantime, my husband came home and reassured me to not worry and that in a month we will try again. He convinced me to go again and this time two young men came along, for they wanted to escape as well. Fear came upon me once more as I thought back to what I have been through and what was more to come. In this moment, my continued strong faith in God gave me hope that we are in His hands and He will lead the way, and His word was true, because we succeeded. Finally, after a long and tiring night of walking into open fields, we arrived in Yugoslavia where we met many other Romanians. After two months, December 1989, a large revolution started in Romania where thousands died for freedom and liberty. We heard the news on TV and we prayed that God’s will be done in our country. Several days after, communism fell, and therefore, President Nicolae Ceausescu together with his wife were shot on December 25, 1989. Since then, Romania became a free country. So, we stayed 9 months in a refugee camp in Yugoslavia, where the Canadian Government sponsored us. Thereafter, we came to Kitchener, Ontario, staying two years. My husband’s occupation as a tourist bus driver, found greater opportunities in British Columbia and we decided to move here. But it was in this time that true and real disaster hit our home because my husband continued to be abusive to our daughters and I, and finally our marriage ended in divorce. For awhile, I didn’t understand God and His purpose. I wanted answers, but didn’t find any. Until one day, God gave me overwhelming peace, stating, “I am with you always and my grace is sufficient for you, for my power is made perfect in weakness” (2 Cor. 12:9). It was in this waiting response that my soul was at rest in all of the brokenness I experienced and was made complete.